The Big Read Kickoff. 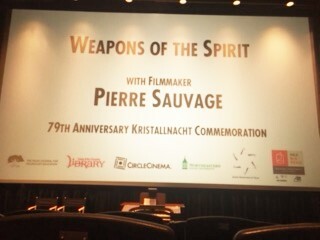 Pierre Sauvage and the movie, Weapons of the Spirit, were the first scheduled events for our Big Read. Pierre gave a very informative talk about the Holocaust and held a brief Q&A. 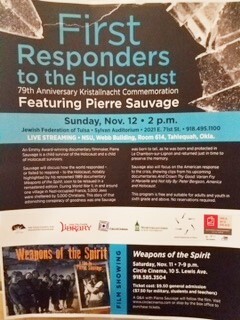 On Sunday, November 12th, Pierre spoke on First Responders to the Holocaust. He told of those who helped save many lives when the Nazis decided to completely wipe the Jews from the face of the earth. He also spoke of those who did nothing. The title of his speech, First Responders, is an oxymoron. There were no first responders as in the sense that there were those brave enough to do something, anything. He definitely gave the audience something to think about.